Since 1965, only 14 men have earned the title of Mr. Olympia. Given their scarcity, surely these men must have some unique insights into what it takes to build an impressive physique. And more often than not, these greats developed a new exercise or technique that led to their stratospheric success. 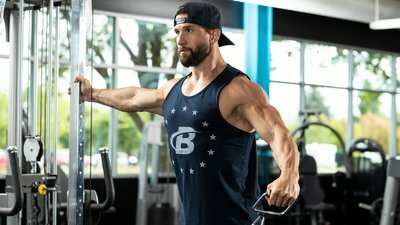 You too can benefit from the experience of these legends, which is why we've rounded up the best shoulder-building training techniques from four of the greatest bodybuilders ever to hit the competitive stage: Arnold Schwarzenegger, Jay Cutler, Lee Haney, and Dorian Yates. Use their methods to help you maximize your own shoulder potential. We all know who came up with this one—it's named after him. In his early days of competition, Schwarzenegger needed a way to develop his shoulders evenly so they could have a rounder, fuller look onstage. He developed this dumbbell movement as a way to train all the heads of the shoulders at once, with heavy enough weight to produce the size and mass he was looking for. Arnold figured out that twisting the dumbbells on the way up and back down activated the rear and side heads of the deltoid while still emphasizing the front heads with the pressing motion. While it's considered a standard move today, in the Golden Era of bodybuilding the Arnold press was a breakthrough. Add to that an increasing weight and decreasing rep scheme, and you've got yourself a pro-level shoulder exercise worthy of the Olympia stage. Pro tip: If you want to make it a little more challenging, alternate moving one dumbbell while the other is pressed out. Jay Cutler had a huge obstacle to overcome in his journey to winning the title in the early 2000s. That obstacle was named Ronnie Coleman. Cutler was aware that he had to be big and wide if he stood a chance of disrupting Coleman's eight-year winning streak and take the title for himself. To build width in his shoulders, Cutler needed to build full, round shoulders and big side delts. Although lateral raises are the standard move for building side delts, they can sometimes incorporate the front head, too, depending on how they are performed. To prevent that from happening, Cutler often performed cable lateral raises one side at a time and using cables. Pro tip: Focus on performing the reps slowly to minimize momentum. The cable allows you to keep tension on the side delts throughout the entire range of motion. Lee Haney might be one of the first Mr. Olympia winners to be as renowned for his back as he was his front. When Haney turned around, the competition didn't stand a chance. One reason for Haney's dominance was his impressive rear delt and trap development. Haney was never an advocate for going super heavy. Throwing plates on the bar for the sake of moving weight held little appeal for him. His focus was to get the best possible contraction, which is why he favored behind-the-back upright rows to develop his shoulders and traps. He felt that having the weight behind him allowed him to get a better contraction of the traps. Going for the upright row instead of the standard shrug forced the delts to get in on the action. This move began as a behind-the-back shrug, until Haney started bending his elbows to try to get a better contraction. He then realized this was a great way to target the rear delts. Behind-the-back upright rows quickly became a staple in his program. Whether you believe this move helped, there's no denying Haney's impressive upper back helped him snag the title of Mr. Olympia eight straight times! Pro tip: Hold the weight at the top for a count of five before going back down. This extra tension can help generate a greater connection to the rear delts and will help create greater density you wouldn't get otherwise. This exercise was made famous by six-time Mr. Olympia Dorian Yates. The exercise played a big role in developing the detail and thickness in the Brit's big back. The machine kept tension on the upper back and rear delts, while restricting the range of motion, allowing Yates to hoist heavy weight with minimum risk of injury. Yates liked the Hammer Strength row, but any machine version will get the job done. Pro tip: A slow tempo, along with a peak contraction at the top, are vital to making this work for you like it did for "The Shadow."